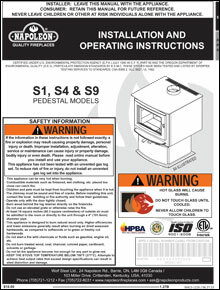 Napoleon’s S Series of Wood Burning Stoves are complete with a modern cast iron door and pedestal base, all in a metallic charcoal finish. Three sizes are available in the S Series line, the S1, S4 and S9. The stoves feature a slide out ash drawer with a removable ash pan and lid for easy cleaning. The S Series Wood Stoves are the perfect wood burning stove for anyone who wants a high technology wood burning stove with a clean, contemporary look. Only available in a pedestal design. Options available include blowers, outside air kit, trim and fresh air cover plate.